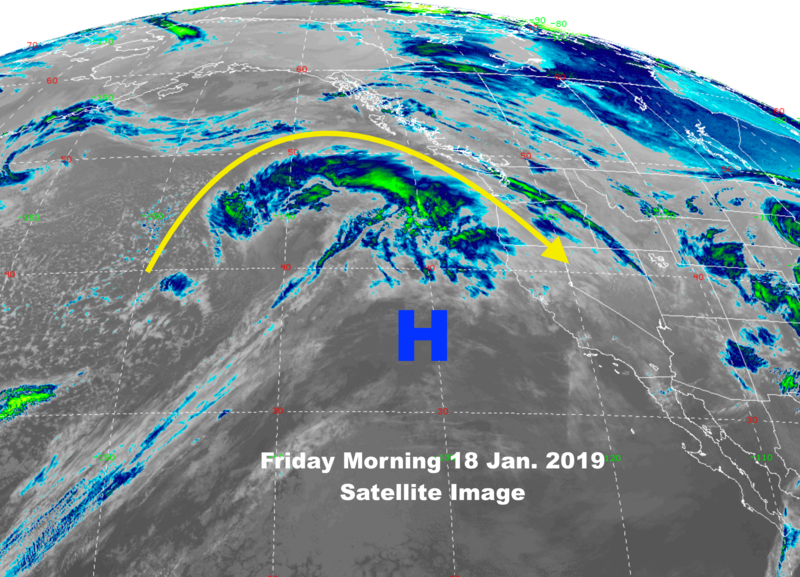 The Low-pressure center that brought good snowfall across the mountain of the Western U.S the last couple of days has moved east into the Plains States. 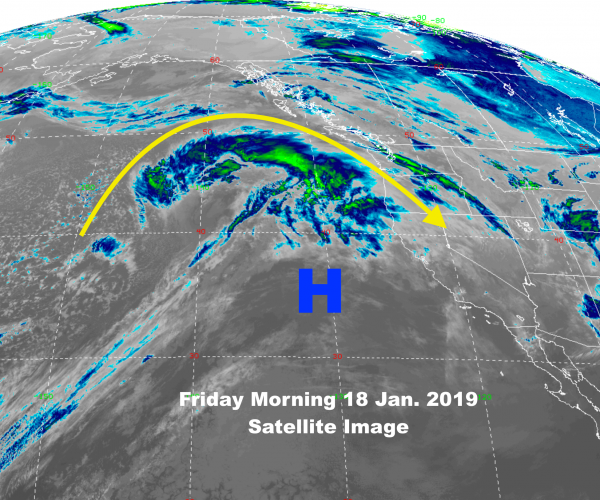 A Ridge of High pressure is now building along the West Coast today, and that Ridge will move east across the Rockies over the Martin Luther King Holiday Weekend. This will result in a Northwesterly flow over the northern Rockies Saturday. Then transitioning to a Southwesterly flow Sunday, ahead of a small upper level disturbance. See Jet Stream (@35,000-ft.) loop below for Friday thru Monday. Temperatures in the Rockies will warm aloft as that Ridge builds inland Saturday. Some rain mixing with snow at lower elevations. Best snowfall accumulations look to be Saturday night thru Sunday, for Sierras, then the Ridge shifts east of the Rockies and colder air returns Sunday-Monday, with best snowfall for Rockies. The Sierra Nevada mountains & the Rockies get some snow from the NW flow & then the WSW flow ahead of the next disturbance moving in from the Pacific. 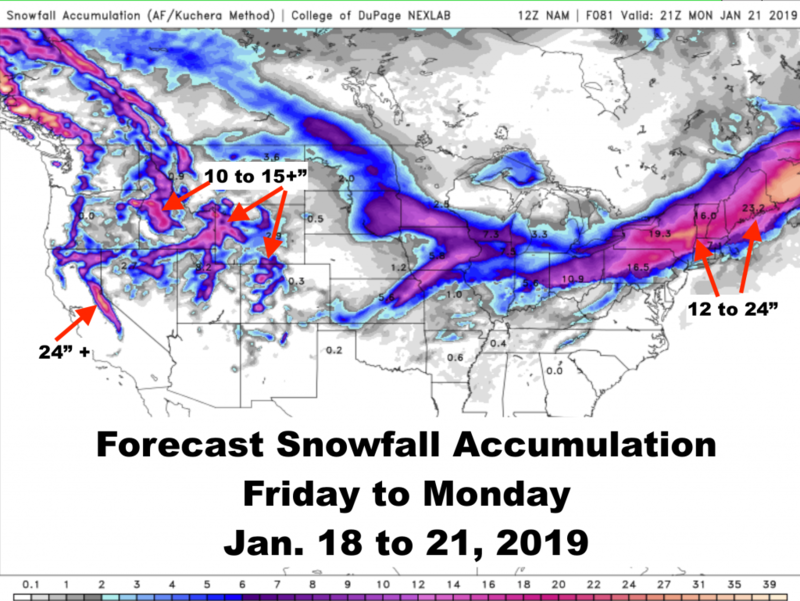 Models vary in the total amounts for different geographic areas……. 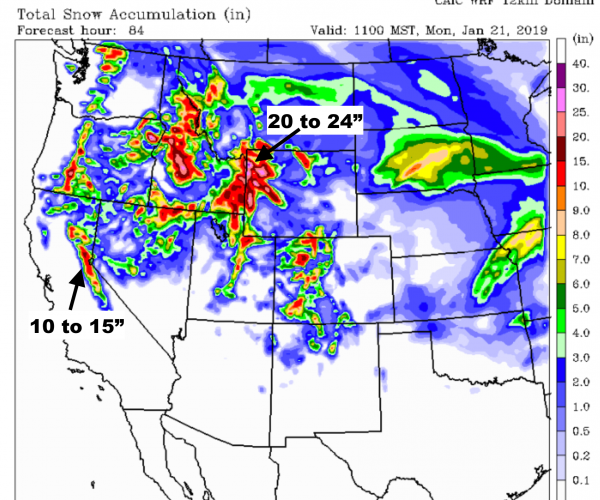 For Example: In the Teton Range of Western Wyoming the NAM shows 10 to 15 inches of accumulation thru the MLK Weekend, whereas, the WRF show much more, 20 to 24 inches. This flip-flops for the Sierra Nevada Range in California, where the WRF shows 10 to 15 in, the NAM has much more, >24 in.!! Go figure? Which model will be correct? (See maps below to compare). By the way, the storm that is exiting the Rockies today will be bringing snow to the mountains of New England later this MLK Weekend. Click map to run loop….